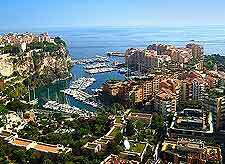 The tax-free haven of Monaco is a tiny and extremely wealthy country, lying in southern France, where it is actually the world's second smallest, after only the Vatican City in Rome. 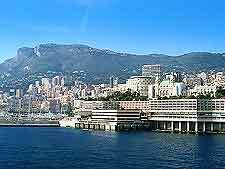 Monte Carlo is the most prominent and popular area of Monaco and serves as the capital, while other important districts include the Old City (Monaco Ville), La Condamine, the industrial area of Fontvieille, and the beachfront suburb of Larvotto. Tourist information is available in Monte Carlo at the Principality of Monaco Tourist Bureau, on the Boulevard des Moulins and close to the much celebrated Grand Casino (Casino de Paris). Monte Carlo is certainly the place to be seen in Monaco and central to the action, being home to the Saint Nicholas Cathedral (Monaco Cathedral). It was here in 1956 that Prince Rainier famously married Hollywood actress Grace Kelly, before they toured the streets in their open-top car, watched by thousands. Today, similar crowds turn up each year in May to watch the Monaco Grand Prix, which uses the streets of Monte Carlo and La Condamine for its circuit, passing the harbour and dating back to 1929. Despite its size, Monte Carlo is packed with some wonderful sights worth seeing. A walk along the Avenue Saint Martin is a good place to soak up the atmosphere and enjoy the views from the cliff-side gardens. The Avenue Princesse Grace is also packed with interest and where the acclaimed Japanese Garden is to be found. However, most will find that nothing sums up the glamour and affluence of Monte Carlo more than its harbour, which is always filled with expensive yachts and the odd celebrity. Sun seekers will no doubt favour the Plages du Larvotto (Larvotto Beach), which is a good public beach with plenty in the way of fun water sports. More information about Monte Carlo Tourist Attractions. The character of Monte Carlo is reflected within its opulent buildings and architecture. None come grander than the Prince's Palace (Palais du Prince), where the daily changing of the guard ceremony is a must-see for all tourists. Guided tours of the Prince's Palace is recommended, while other important landmarks within Monte Carlo include the Opera House and the Saint Charles Church, which is easily found, since it sports a particularly tall and hard-to-miss bell tower. Within Fontvieille, the Louis II Stadium is often to be found hosting major sporting events and can seat more than 18,000 spectators. 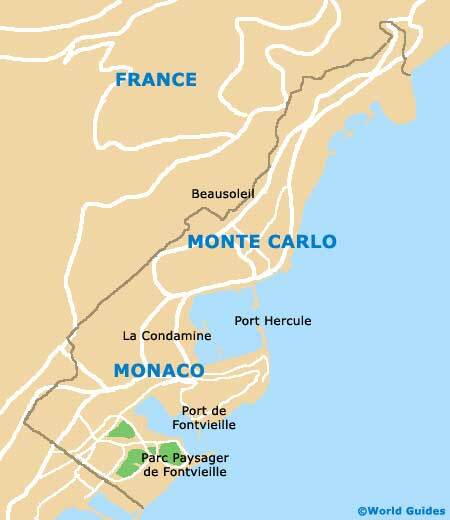 More information about Monte Carlo Landmarks and Monuments. 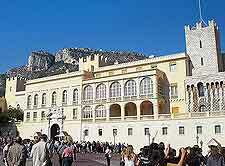 Various museums are spread around the streets of Monte Carlo and Monaco, often being especially appealing to families. The Oceanographic Museum and Aquarium is one such attraction and features an excellent restaurant, overlooking the Riviera. Nearby, the appealing information and historical exhibits found within the Museum of Prehistoric Anthropology may be of interest, along with the rather unexpected and impressive Prince of Monaco's Collection of Classic Cars. If art is more your thing, then the main avenues of Monte Carlo are littered with pricey galleries, with highlights including both the Marlborough Fine Art Gallery and the Galerie Monaco Fine Arts. More information about Monte Carlo Museums and Monte Carlo Art Galleries. Monaco enjoys a stunning location on the southerly coastline of France and lies next to the famed French Riviera, where many wonderful day trips present themselves to tourists. Those holidaying in Monte Carlo will find themselves within easy reach of some major French cities and resorts, such as Antibes, Cannes, Nice and Saint Tropez, all of which are just a short drive away. Standing a little further from Monte Carlo are cities such as Aix en Provence and Marseille, and if you are prepared to cross the neighbouring border of Italy, you can even explore the delights of Genoa. More information about Monte Carlo Attractions Nearby.